The Drager Flame 2300 is an explosion proof combined UVIR flame detector used for the detection of hydrocarbon based fires. The detector provides flexibility with its numerous output modes, and advanced design features ensure reliability in the detection of fires whilst at the same time providing excellent immunity to potential false alarm sources. Installation is simple! The detector is easily installed with a stainless steel mounting bracket; this can be rotated to ensure optimum positioning of the detector in relation to the potential fire source. Angular markings allow the positioning angles of the detector to be recorded for future reference. Au to matic checks of the detector electronics and optics ensure no fault goes undetected. Additionally the test can be triggered manually at anytime. 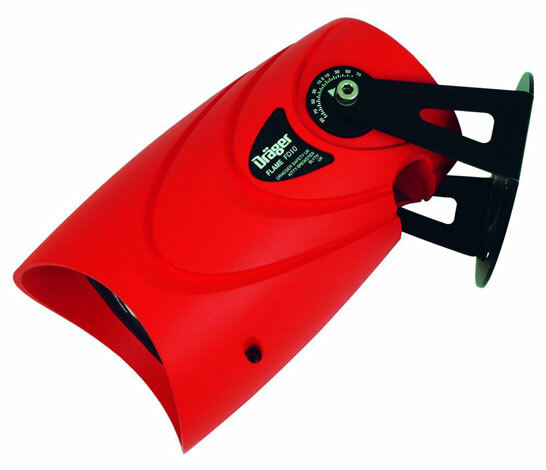 The Drager Flame 2300 provides the highest level of false alarm immunity. This is because the detector requires both IR and UV sensors to alarm before the detector will itself output an alarm condition and such action ensures that false alarms are all but non-existent. The Drager Flame 2300 can be used worldwide with the following approvals: ATEX, IECEx, FM and CSA.